want to program the CPLD. The CPLD is a Complex Programmable Logic Device or at least that's what it stands for. The concept of the pld has in effect has really revolutionized the electronics industry because of the great advantages they offer. The simple fact that they can execute concurrently gives PLDs a huge advantage in implementations over conentional processors. 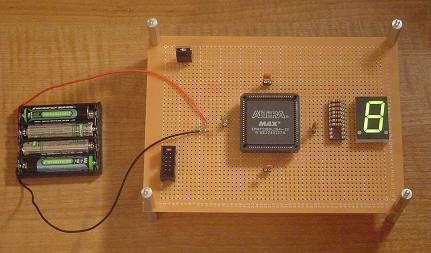 This tutorial will be using the MAX7128SLC84-10 device. 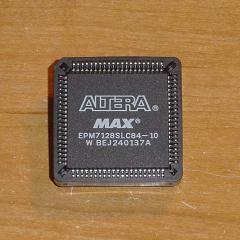 Any of the MAX7000A series can be substituted, although your device may have fewer or more pins. The goal of this tutorial is to create a working development board for the MAX CPLD 7128SLC84-10. This is a standard CPLD that has many thousand logic cells. The development board will have one peripheral device, a 7 segment LED character display. This display will prove that we can program the CPLD through the JTAG port installed & that the board works.